"Oh Sarah. Don't you forget me"
After Christmas, Doctor Who returned for the final two stories in Season 13. 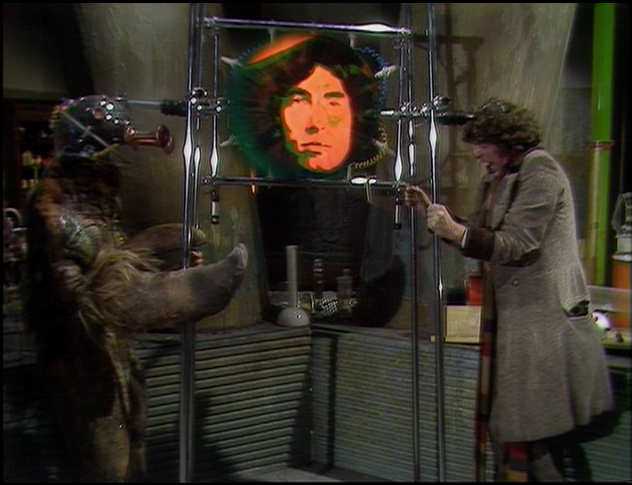 First up is 'The Brain of Morbius' which introduces another renegade Time Lord to the series. Morbius is a war criminal who led a rebellion against his fellow Time Lords and wound up being executed for it. 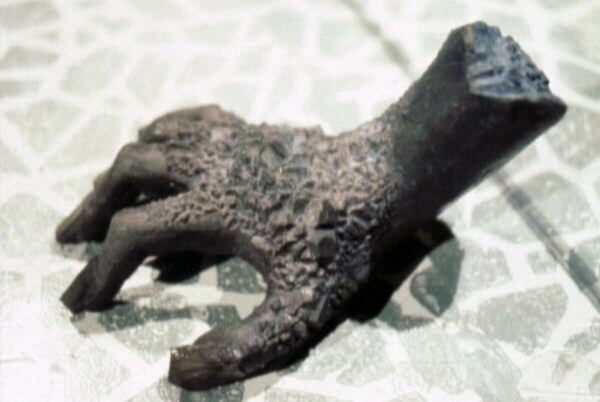 Unknown to everyone his brain survived in the care of one of his more fanatical followers, Solon, who takes it to the planet Karn in order to create a new body for Morbius. For those who haven't guessed yet this is 'Doctor Who meets Frankenstein'. 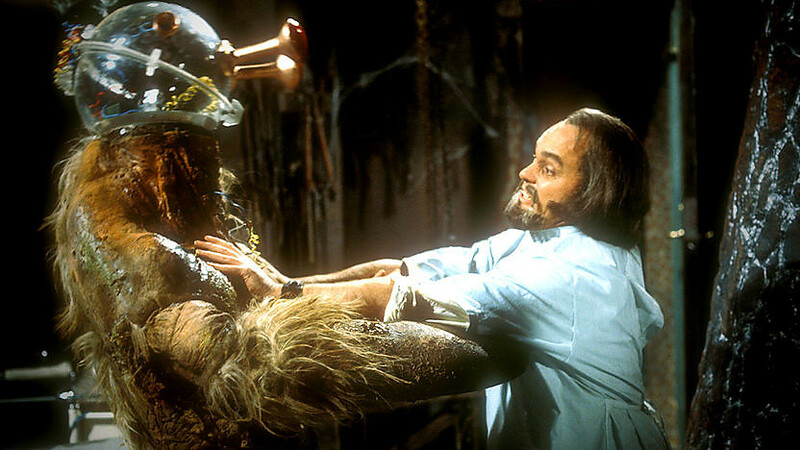 Needless to say, Morbius's brain does eventually find its way into a new body, although it's not quite what he was expecting, and ends up coming a cropper when he challenges the Doctor to a mind-bending duel. This duel has caused much debate within Doctor Who fandom for many years and will probably continue to do so for many years. The aim of this contest is for each Time Lord to try and force their opponent back through their previous regenerations, with the end result being death for one of the combatants. 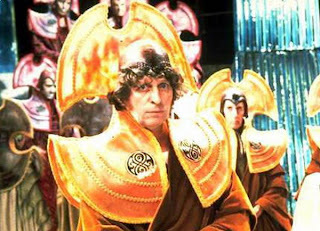 The progress of this contest is shown on a screen which brings up pictures of a Time Lord's previous incarnations as he is forced to regress back through them. 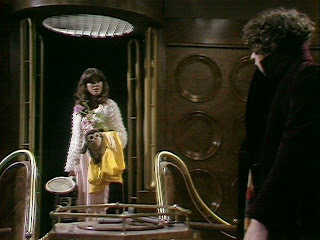 Where the controversy lies is that, at the climax of his contest with Morbius, the Doctor is clearly losing. 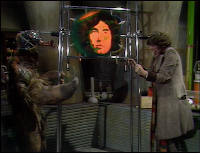 On the screen we see pictures of the Fourth Doctor, then the Third, the Second, the First...and then some pictures of other men in strange costumes. These aren't pictures of the Doctors that we've seen in the series so who are they? Some, including members of the production team, say that these men were versions of the Doctor from before William Hartnell which would mean the First Doctor isn't really the First Doctor. Other says that these are pictures of Morbius's earlier incarnations although that wouldn't make much sense within the rules of the contest. Whose right? At the moment the jury is still out. The final story of the season brings us back down to Earth with 'The Seeds of Doom' where the Doctor and Sarah investigate some mysterious seed pods that have crashed to Earth in Antarctica. The seed pods are alien and quickly grow into monstrous Krynoids - sentient plants who take over human beings and transform them more of their own kind. However the true villain of the piece is the mad millionaire Harrison Chase, who prefers plants to human beings and turns people that he doesn't like into fertiliser. Not surprisingly he takes an interest in the Krynoids and, equally unsurprisingly, things do not go well when he tries to take control of them. Perhaps fittingly, Chase ends up in his own fertiliser making machine, while the Krynoid is eventually blown up by the combined forces of the RAF and UNIT. Incidentally, UNIT's brief appearance at the end of this story is the last that we'll see of this organisation for some years. Doctor Who took a break for the summer after 'Seeds of Doom' and returned for Season 14 in the September of 1976. The first stop for the Doctor and Sarah was Renaissance Italy in 'The Masque of Mandragora'. 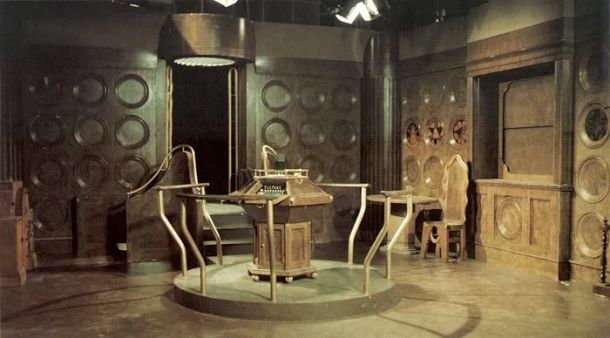 This story introduced a small but significant addition to the Doctor Who mythos: the idea that the TARDIS has more than one control room. In the opening episode of this story, the Doctor shows Sarah the secondary console room - a wood-panelled affair that looks more like a Victorian drawing room than anything else. 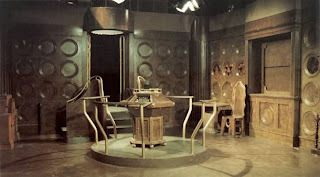 This console room was used throughout Season 14. It's entirely in keeping with the more Gothic nature of the series at this point and it's a pity that the wood used to construct the set warped whilst it was in storage as it meant that, after this season, we never get to see it again. The story itself concerns an alien entity - the Mandragora Helix - which hitches a ride in the TARDIS and takes the Doctor and Sarah to 15th Century Italy. The Helix wants to stop Earth from coming out the Dark Ages and ever becoming technologically advanced enough to pose a threat to the Helix itself. The historical Italian setting meant that a lot of exterior filming was done in the Welsh village of Portmerion - most famous of course for being used as The Village in 'The Prisoner'. The Italian style architecture in Portmeirion makes it the ideal location and its presence really adds something to the overall quality of the production. In some ways it's a slightly unsatisfying exit for a character who has been one of the longest running and most popular companions of the series to date. Why didn't the Doctor just go back and get Sarah again after he'd finished his business on Gallifrey? In years to come we will get an explanation of sorts and the final scene between the two of them is so good that you can overlook the fact that it's a bit of poor excuse to get rid of the chracter. Besides, it's not like we'll never see her again. 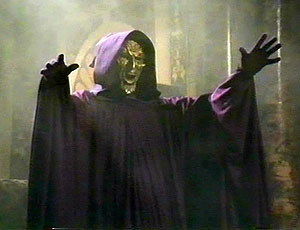 Meanwhile, the Doctor has an urgent summons to respond to in 'The Deadly Assassin'. This is an important story in that it does a lot to establish Time Lord society and gives them a history, much of which is still used and acknowledged today, as well re-introducing the character of the Master. So much background on the Time Lords is given here that I'm sure to forget something but, amongst other things we get the first references to Rassilon - founder of Time Lord society, the Eye of Harmony (the power source that allows Time Lords to travel in time), the Citadel on Gallifrey where the Time Lords are based and the Matrix, a machine containing memories of dead Time Lords that could be used to predict the future. This is also the story where it is confirmed that Time Lords only have thirteen lives and where, for the first time we see Time Lords in the robes and headdresses with which they are always associated. As mentioned above, the Master is back albeit in a decayed and emaciated form having used up all his previous regenerations. Here he's setting the Doctor up for a fall by trying to frame him for the assassination of the Time Lord President. To prove his innocence the Doctor takes a mental journey into the Matrix itself to find the true assassin, a Time Lord chancellor called Goth who is in the employ of the Master. This confrontation in the Matrix takes the best part of a entire episode and climaxes with Goth attempting to drown the Doctor. 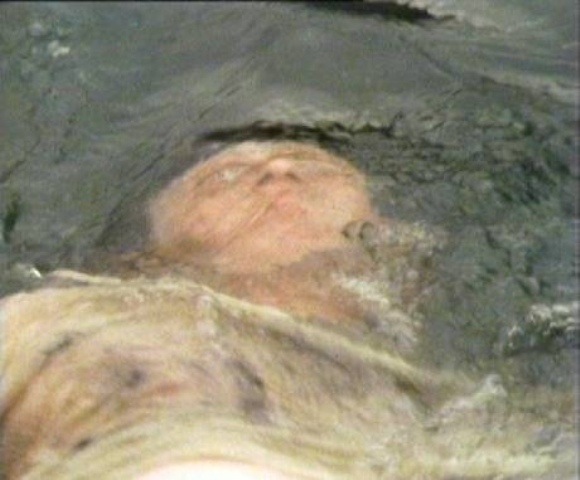 This was one cliffhanger too far for Mary Whitehouse who complained to the BBC about the final shot of the episode which saw the Doctor's head being shown underwater. Fortunately, the Doctor escapes being drowned and is able to stop the Master's main plan which involves using the Eye of Harmony to rejuvenate himself. The Master may not have been able to restore his former good looks but he does manage to escape Gallifrey so it's fair to say that he'll be back. 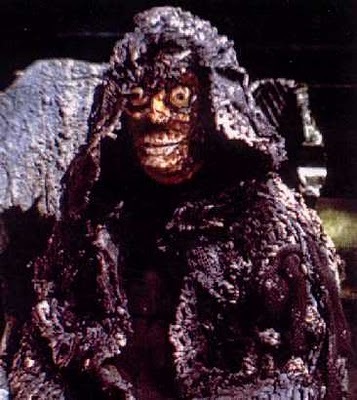 'The Deadly Assassin' ended on 20th November 1976 after which Doctor Who took a break until January 1977. 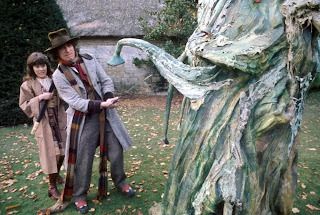 When the series returned it would be with a new companion for the Doctor. There were two productions of note this year. The first was part of a Radio 4 school's programme called Exploration Earth. 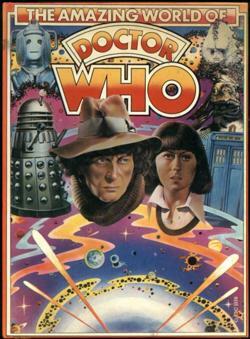 This geography series turned one of its episodes into a mini Doctor Who episode featuring Tom Baker and Elisabeth Sladen as the Doctor and Sarah. The two of them take a trip in the TARDIS to watch the creation of the Earth. This being a Doctor Who story, there is a villainous presence in the form of Megron 'Lord of Chaos', who tries to take control of the Earth whilst it's in the process of creation. Naturally he's defeated and the Earth is saved for the first of many times in its history. The second production this year was 'The Pescatons', released as an LP in the July of 1976. 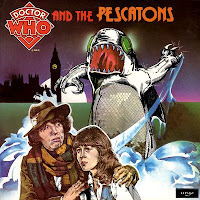 Once again Tom Baker and Elisabeth Sladen reprise their roles, this time to face the fish-like Pescatons and their leader, Zor, who are invading Earth. The story is primarily narrated by the Doctor in the first-person with a few parts dramatised with the addition of Sarah or Zor. One particular point of interest is that the story was written by Victor Pemberton who had previously worked on Doctor Who (as script editor and writer) back in the Patrick Troughton era. As such there are one or two aspects of the Doctor's personality here that hark back to the Second Doctor. Most notably the Doctor. at several points in the story, plays a piccolo which is not dissimilar to the Second Doctor's playing a recorder. Another big crop of books released this year. On the novelisation front, ten new books were issued from what was now becoming a regular stable of writers. 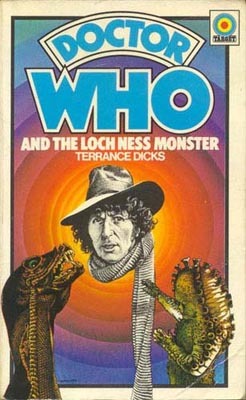 Chief amongst them of course was Terrance Dicks who wrote six of the books: 'The Loch Ness Monster' (aka 'Terror of the Zygons'), 'Revenge of the Cybermen', 'Genesis of the Daleks', 'The Web of Fear', 'Planet of the Daleks' and 'Pyramids of Mars'. The other books were written by previous contributors to the range. 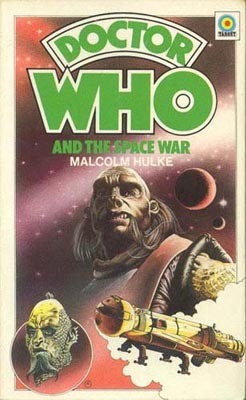 Malcolm Hulke novelised his scripts for 'Invasion of the Dinosaurs' (renamed 'The Dinosaur Invasion') and 'Frontier in Space' (renamed 'The Space War'). 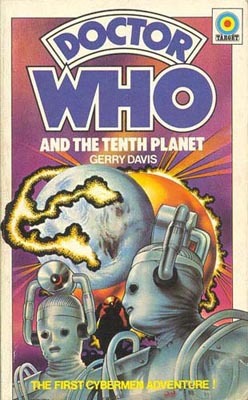 Meanwhile Brian Hayles novelised Second Doctor adventure 'The Ice Warriors' and Gerry Davies novelised 'The Tenth Planet' - the first First Doctor story to be novelised since the original three books that were released back in the 1960s. In other book news: 'The Amazing World of Doctor Who' was a book that was only available as part of a special promotion by TyPhoo Tea. Fortunately, if you parents didn't drink TyPhoo and you couldn't get the book it didn't appear that you were missing out too much as it was pretty much a reprint of the 1976 Doctor Who Annual but with a new cover. Speaking of Annuals, the 1977 edition was released in late 1976 along with the latest Dalek Annual. Also published towards the end of the year was 'The Doctor Who Dinosaur Book' a slim non-fiction book that provided the reader with facts about the history of the dinosaurs. The popularity of this book would pave the way for a similar series of such books in the future. Finally, a couple of revised reprints were issued. 'The Doctor Who and the Daleks Omnibus' was a large hardback book which primarily contained reprints of the novelisations of 'Genesis of the Daleks' and 'Planet of the Daleks.' 'The Making of Doctor Who' - originally published in 1972 - almost received a reprint this year, although it was revised and updated with some new material. I have to confess that I don't really have anything much to say on the comic strip this time, mostly because I haven't actually read any of them. Needless to say though they continued throughout the year in TV Comic and Sarah Jane continued to appear alongside the Doctor throughout. She does however disappear after the final strip of the year, entitled Dredger.